Wolf repeatedly revealed his love of Joni Mitchell, whether expressing his joy at playing a gig on Bleecker Street, which she haunted in her hey day, performing her song "Tin Angel," or telling tales of his early career, where he'd sing for his supper in a pub using Joni's songs with a few of his own thrown in. The cold chimerical beauty of Wolf's work was deepened by the warmth of his tenor and his charming and quaint storytelling. It was an extremely intimate and inviting evening, one in which Wolf claimed his place as a talented multi-instrumentalist, a weaver of tales both otherworldly and real, and, above all, as a 21st century chanteuse dandy, able to express a wealth of emotions, from the blackest to the brightest. The androgynous boy who sang "I used to say just follow your dreams, but my dreams always led me to murder," has so very many sides to him: cynical and sweet, sentimental and serious. 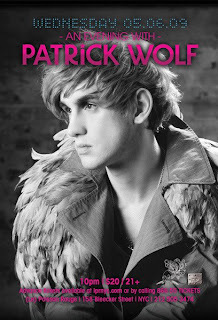 Patrick Wolf is undoubtedly one of the most darkly enchanting singer/songwriters of today.